The company has carved a niche for itself in the domestic and global markets as a Manufacturer, Exporter & Supplier of Woolen Stoles. The company is involved in the production as well as worldwide marketing of a wide range of the Woolen Stoles. The Woolen Stoles Collection, offered by the company, is inclusive of Plain Woolen Stoles as well as Printed Woolen Stoles. The style and simplicity of the Woolen Stoles has many admirers around the globe and the company offers the collection at the best prices. 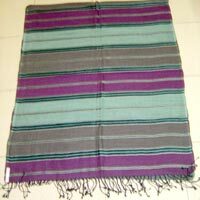 The company is known as a major Manufacturer, Exporter & Supplier of Plain Woolen Stoles. The Plain Woolen Stoles, offered by the company, are simple yet elegant additions to the daily wear. The Plain Woolen Stoles are competitively priced and can be delivered on a timely basis in the safest manner possible.